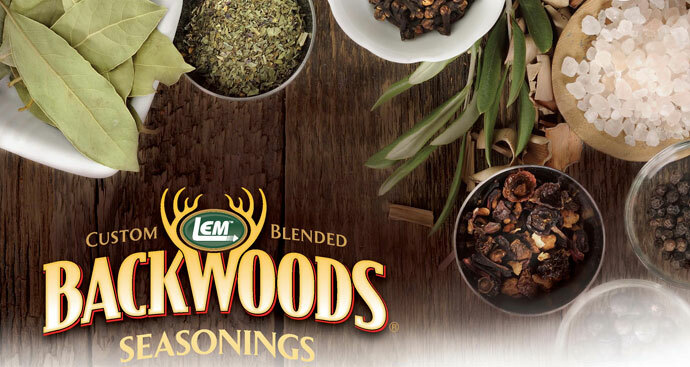 Here you'll find everything you need or want to know about Backwoods® Seasoning. Click on what you want and you'll find the back of each seasoning packet - includes nutritional information, ingredients, instructions, and even suggestions for use. We hope you're hungry! Enjoy! • 9002 Breakfast Seasoning Makes 5 lbs. • 9006 Breakfast Seasoning Makes 25 lbs. • 9004 Sweet Italian Seasoning Makes 5 lbs. • 9008 Sweet Italian Seasoning Makes 25 lbs. • 9005 Hot Italian Seasoning Makes 5 lbs. • 9009 Hot Italian Seasoning Makes 25 lbs. • 9003 Hot Breakfast Seasoning Makes 5 lbs. • 9007 Hot Breakfast Seasoning Makes 25 lbs. • 9266 Chorizo Seasoning Makes 5 lbs. • 9010 Chorizo Seasoning Makes 25 lbs. • 9267 Fresh Polish Seasoning Makes 5 lbs. • 9011 Fresh Polish Seasoning Makes 25 lbs. • 9389 Bratwurst Seasoning Makes 5 lbs. • 9012 Bratwurst Seasoning Makes 25 lbs. • 9699 Cajun Seasoning Makes 5 lbs. • 9014 Cajun Seasoning Makes 25 lbs. • 9086 Garlic Seasoning Makes 5 lbs. • 9015 Garlic Seasoning Makes 25 lbs. • 9624 Maple Breakfast Seasoning Makes 5 lbs. • 9013 Maple Breakfast Seasoning Makes 25 lbs. • 9087 Kielbasa Seasoning Makes 5 lbs. • 9018 Kielbasa Seasoning Makes 25 lbs. • 9016 Fresh Variety Pack: Breakfast, Hot Breakfast, Sweet Italian & Hot Italian Makes 20 lbs. • 9562 Bratwurst Kit with 32mm Collagen Casings Makes 20 lbs. • 9563 Breakfast Kit with 21mm Collagen Casings Makes 20 lbs. • 9564 Sweet Italian Kit with 32mm Collagen Casings Makes 20 lbs. • 9565 Hot Italian Kit with 32mm Collagen Casings Makes 20 lbs. • 9272 Trail Bologna Seasoning Makes 5 lbs. • 9273 Trail Bologna Seasoning Makes 25 lbs. • 9275 Bratwurst Seasoning Makes 5 lbs. • 9276 Bratwurst Seasoning Makes 25 lbs. • 9277 Salami Seasoning Makes 5 lbs. • 9278 Salami Seasoning Makes 25 lbs. • 9279 Smoked Polish Seasoning Makes 5 lbs. • 9280 Smoked Polish Seasoning Makes 25 lbs. • 9281 Smoked Sausage Seasoning Makes 5 lbs. • 9282 Smoked Sausage Seasoning Makes 25 lbs. • 9508 Summer Sausage Seasoning Makes 5 lbs. • 9385 Summer Sausage Seasoning Makes 25 lbs. • 9025 Jalapeno Summer Sausage Seasoning Makes 5 lbs. • 9040 Jalapeno Summer Sausage Seasoning Makes 25 lbs. • 9626 Bologna Seasoning Makes 5 lbs. • 9627 Bologna Seasoning Makes 25 lbs. • 9628 Franks Seasoning Makes 5 lbs. • 9629 Franks Seasoning Makes 25 lbs. • 9697 Andouille Seasoning Makes 5 lbs. • 9698 Andouille Seasoning Makes 25 lbs. • 9509 Pepperoni Seasoning Makes 5 lbs. • 9465 Pepperoni Seasoning Makes 25 lbs. • 9017 Cure Variety Pak: Summer Sausage, Pepperoni, Original Snack Stick & Original Jerky Makes 20 lbs. • 9283 Summer Sausage Kit Makes 10 lbs. • 9284 Summer Sausage Kit Makes 20 lbs. • 9285 Trail Bologna Kit Makes 10 lbs. • 9286 Trail Bologna Kit Makes 20 lbs. • 9024 Cracked Pepper Jerky Seasoning Makes 5 lbs. • 9044 Cracked Pepper Jerky Seasoning Makes 25 lbs. • 9154 Hickory Jerky Seasoning Makes 5 lbs. • 9622 Hickory Jerky Seasoning Makes 25 lbs. • 9064 Original Jerky Seasoning Makes 5 lbs. • 9620 Original Jerky Seasoning Makes 25 lbs. • 9023 Jalapeno Jerky Seasoning Makes 5 lbs. • 9043 Jalapeno Jerky Seasoning Makes 25 lbs. • 9153 Mesquite Jerky Seasoning Makes 5 lbs. • 9621 Mesquite Jerky Seasoning Makes 25 lbs. • 9022 Cajun Jerky Seasoning Makes 5 lbs. • 9042 Cajun Jerky Seasoning Makes 25 lbs. • 9155 Hot Jerky Seasoning Makes 5 lbs. • 9623 Hot Jerky Seasoning Makes 25 lbs. • 9083 Teriyaki Jerky Seasoning Makes 5 lbs. • 9085 Teriyaki Jerky Seasoning Makes 25 lbs. • 9021 BBQ Jerky Seasoning Makes 5 lbs. • 9041 BBQ Jerky Seasoning Makes 25 lbs. • 9088 Sriracha Jerky Seasoning Makes 5 lbs. • 9089 Sriracha Jerky Seasoning Makes 25 lbs. • 9156 Jerky Variety Pak # 1: Original, Mesquite, Hickory & Hot Makes 20 lbs. • 9157 Jerky Variety Pak # 2: Cajun, Jalapeno, Cracked Pepper & Teriyaki Makes 20 lbs. • 9507 Snack Stick Seasoning Makes 5 lbs. • 9692 Snack Stick Seasoning Makes 20 lbs. • 9268 Hot Stick Seasoning Makes 5 lbs. • 9269 Hot Stick Seasoning Makes 20 lbs. • 9271 Pepper Stick Seasoning Makes 5 lbs. • 9630 Pepper Stick Seasoning Makes 20 lbs. • 9387 Snack Stick Variety Pak: Original, Pepper, Hot & Pepperoni Makes 20 lbs. • 9694 Snack Stick Kit Makes 20 lbs. • 9695 Hot Stick Kit Makes 20 lbs. • 9696 Pepper Stick Kit Makes 20 lbs. • 9990 Original Jerky Seasoning Bucket Makes 100 lbs. • 9991 Summer Sausage Seasoning Bucket Makes 100 lbs. • 9992 Snack Stick Seasoning Bucket Makes 100 lbs. • 9993 Trail Bologna Seasoning Bucket Makes 100 lbs. • 9994 Jalapeno Summer Sausage Seasoning Bucket Makes 100 lbs. • 9995 Bratwurst Seasoning Bucket Makes 100 lbs. • 9996 Breakfast Sausage Seasoning Bucket Makes 100 lbs.